This summer Lauren from lladybird.com and I are teaming up to combine a sew along with a knit along. The idea is to knit a garment and sew a garment to make a coordinated handmade outfit. It’s a great opportunity to stretch your crafting skills, and we’ll have two official patterns that we’ll help you with along the way. Our sewing pattern will be Simplicity 1803, and our knitting pattern will be my new Myrna cardigan pattern. Lauren will be writing a series of posts on her blog on sewing the dress, and I’ll write about the knitting side of things on my blog, untangling-knots.com. 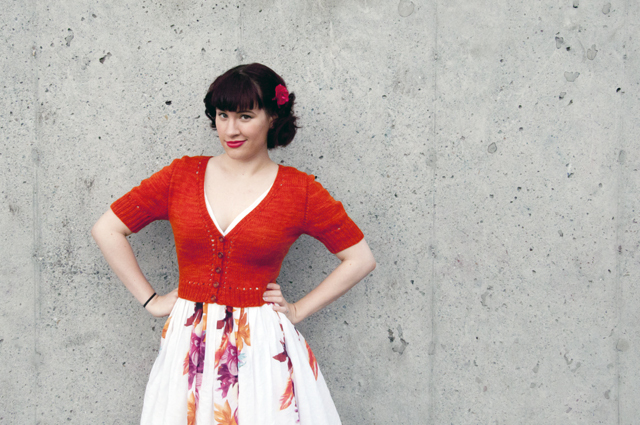 This is a perfect time to try knitting your first sweater or sewing your first dress. If you’re not a fan of one or both of the official patterns but still want to participate in the Outfit Along, don’t worry! You can still join in. To be a part of the Outfit Along, all you need to do is knit a garment and sew a garment that are meant to go together. Lauren and I want everyone to make outfits that they’ll really wear, so pick two projects to suit your own style and skills. You can still be eligible for prizes even if you don’t knit and sew the two official patterns. The Outfit Along will start June 1st which gives you a little time to start planning your projects. The deadline is July 31st, so you have two months to make your two pieces. 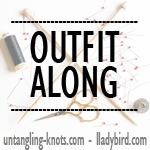 If you post photos of your final outfit in the OAL Finished Outfit thread in the Untangling Knots group on Ravelry by July 31st, you’ll be eligible to win some fun prizes like Untangling Knots knitting patterns and gift certificates for indie sewing pattern companies. Prize winners will be randomly selected from those who finish both their knit and sewn garments and post pictures in the appropriate thread by the deadline. And to get things started, Myrna is available today, and you can get the pattern for 20% off up until the OAL officially starts on June 1st using the coupon code OAL2014. It’s totally seamless, and knit using worsted weight yarn on US 8/5 mm needles. You can read more details in the Untangling Knots shop or check Myrna out on Ravelry. 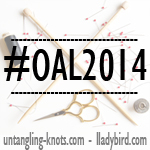 Help spread the word and grab one of the badges below or use the hashtag #OAL2014. If you want to hang out and chat about the OAL, come join the Untangling Knots group on Ravelry. OMG! I am so in love with this idea. Hmm… I’m not sure what is causing that to happen. Sorry! OMG I am so in, I’ve got Yowza in my stash as well as the dress pattern. It’s a sign from the knitting and sewing goddess! @Ness, I have the Washi dress pattern, too! I was thinking of buying the one that’s part of the Outfit Along, but using what I have would be better (more money to spend on fabric and yarn). This is a great idea! Heck yeah I’ll be joining in! So excited for this, as I’ve already knitted a few of your patterns and they are aces… What patterns to choose?? Ahh!! Oh what fun, I’m in! I love your patterns, but as yet haven’t had the courage to try any. I’m still very much a novice knitter so this sounds perfect for me. I have another Pattern Runway pattern I’ll use for the dress ( y’know, the one every one makes, code escapes me ATM!). It has been sat in my stash for ages so now is the time 🙂 Right, off to buy Myrna! You never know! 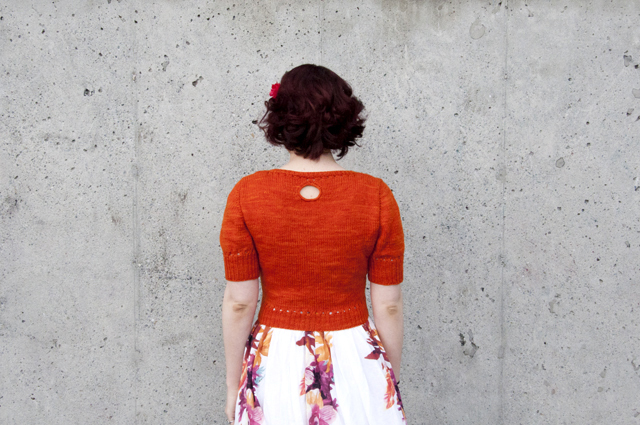 Myrna is a pretty quick sweater to knit. This is a really cool idea! What counts as a knitted “garment”? Are socks and shawls fair game, or does it need to be something more substantial? It needs to be an article of clothing, not an accessory or hosiery. You can knit a cardigan, a pullover sweater, a tank top, a skirt if that’s your style, a vest, etc. Question from a knitting nnewbie: You said the finished garment is meant to have 0-3 inches of negative ease, and then gave finished bust measurements. So does that mean if I want a closer fitting sweater, them I take my actual bust measurements and subtract 2-3 inches and that gives me the pattern size to make? So if my bust is 41, then I would make a 37 or 38? Yep! It sounds like you’ve got the right idea, but you might find this blog post on choosing a size interesting if you’d like to know more. What a great idea! I’m going to try and do this! Fun! This IS a great idea. My knitting skills are weak so I was reluctant to join. Then, I found myself buying the Myrna pattern and ordering some gorgeous yarn. I’m not sure about the dress pattern style, but I think it will work (Muslins always tell the tale.) So….I’m going to do this. I should be able to complete both projects in 2 months, but I will finish them in any case. Thanks to you and Lauren for organizing this. You can always swap out the dress pattern for a different sewing pattern if you’re not sure about the style. Yea!! This is such a fun idea. I LOVE the Myrna pattern. (You make the most excellent patterns). I’ll probably swap out the dress pattern, though. I’m a total newbie at sewing. I super love this idea! I have some yowza in my stash and have already got a vest pattern to use it for (though I am super in love with your new pattern) I also have a tone of new dress patterns I haven’t had time to sew up. But I do need to know what dress are you wearing underneath? Did you make it because it looks like a perfect match for this cute cardi! I didn’t make it; I bought it years ago. I’ve actually only sewn one dress for myself so far! 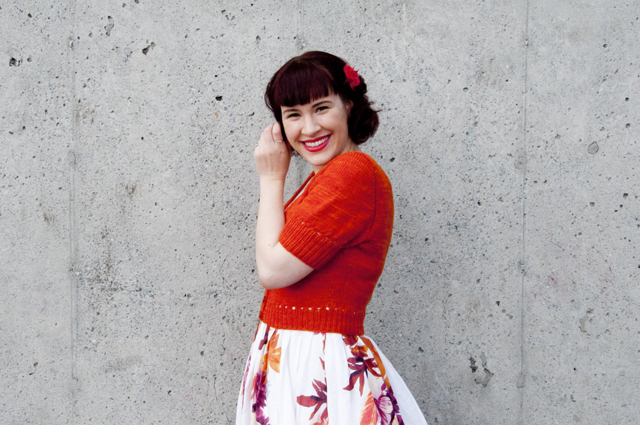 I’m currently knitting a Miette, which I’m making specifically to wear with a skirt (not a dress, sorry!) I finished at the end of April. Assuming it’s not finished yet by the day the knitalong/sewalong starts, is this eligible for the Outfit Along? The Myrna is lovely, not sure if I’m going to knit it in a very near future but I’m definitely putting it in my queue on Ravelry! I can’t really do much to keep track of and enforce that sort of thing, but the idea of the Outfit Along is to make both of the pieces during the two months of the event, so I’d like it if everyone made their pieces along with everyone else. Well, as I’ve finished my Miette last Sunday, it seems I am now free to jump on the Outfit Along bandwagon!Count me in, then! If anyone in the Seattle area wants to get together in a bar somewhere and work on our Myrnas, I’m down! You should come to the Blue Star in Wallingford on a Monday night! That’s where my knitting group meets. This is the best idea ever! I’m in though I don’t have a clue yet about my outfit, probably another dress because I already have a lot of patterns waiting in line with the fabric next to it (or rather multiple options, just in case) and Myrna can be a good combination if I find the yarn in my stash. I am just ready to cut my fabric for Simplicity 1803 and then I’ll be ready for the knitting part. I love the sweater pattern – and it will be a big hurdle for me to overcome knitting this sweater- but I plan to do it all by July 31st. Hi there! I really want to join in, but I wanted to ask– can I crochet my sweater? 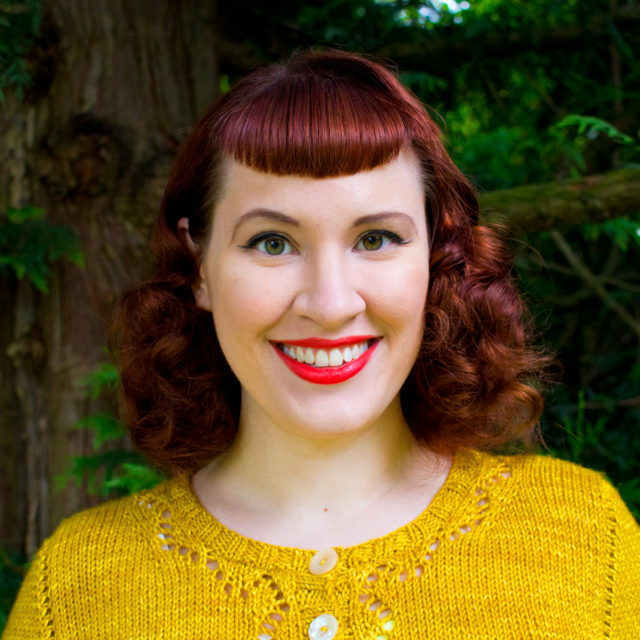 I found a great top-down crocheted sweater pattern on Ravelry and I’m dying to have an excuse to go for it. I know I should learn to knit, but I just haven’t gotten to a point where it is any fun for me. It just makes me want to crochet more! I’m going to say yes, crochet can count. It’s similar enough. Yippee! Thanks for giving me a great excuse to go yarn shopping! You’re not too late to join! You’ve still got a few weeks to make your outfit. in the early hours in the dawn, as i love too gain knowledge of more and more.